It is with heavy hearts we announce the death of Theresa Garrett (Thomas) of Airdrie, Alberta. 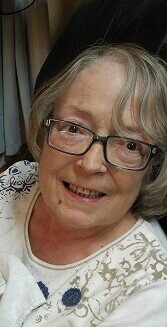 She passed peacefully January 25, 2019, at the age of 67. Theresa loved more than she ever wanted you to know. Her sharp wit, large heart, and powerful presence had created a space in our lives that will never be the same. Her grandchildren were her world, and a common joke was the newest one, was the favourite. Unless it was her dog Chevy, then he was the favorite. Theresa always made you feel loved, and welcome, no matter the circumstance. She would never hesitate to tell you why you were wrong either. Theresa was an incredibly dynamic woman, with skills in sewing, and quilting, which lead to vast collections of patterns, fabric, and antiques. She was also a well-established book keeper in her community. Theresa is survived by three children, Courtney (Smith), Brandon, and Tyler. Her husband, Michael. She has also left behind a legacy with her Grandchildren, whom she loved very much. Keeley (12), Elizabeth (8), Felix (6), Finlay (5), Cheydon (3) and, Edelynn (2). She left behind a very dear and, close friend in her cousin Marilyn Smith. She is preceded in death by her parents, Ward, and Joan, as well as her brother Russell, and sister, Denise. Theresa will be missed by many people, including cousins, friends, nieces, and nephews. Her impact was subtle and far reaching. We will always be thankful for the time we had her in our lives. A Celebration of Life will be held from 1:00 pm-3:00 pm, February 15, 2019 at Balzac Community Hall. 10075, TWP 262, Balzac, AB T4B 2T3. In lieu of flowers, donations can be made to the Rosebud Health Foundation, 1-403-335-7626, 1210 20th Avenue, Box 130, Didsbury, Alberta. Theresa will be deeply missed. I was so lucky to have known her and she will always hold a very special place in my heart. My condolences go out to her family.